I've already blogged about Harvey's lips -- a weird post, maybe, but Harv's lips are especially cute, especially now that they droop heavily when he is sleeping. This winter I'm also in awe of Harvey's ears. I mean, I assume he still has them, but I can't be sure. There are two giant puffballs of fur atop his head -- probably somewhere in there are his ears. Does anyone know, is this the sign of a harsh winter? 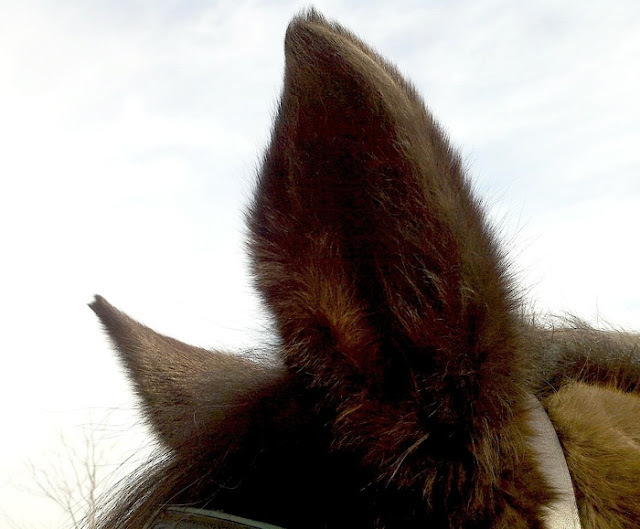 I love horse ears. They are so expressive! Haha, so cute. I love fluffy winter ears. Jack's are so fuzzy that his ears sweat after a workout. Honest. Those are some cute ears! I also like the white, short, fluffy ears of our Icelandic horse. Yup, fuzz ball ears... Gotta love them! Hey, maybe that's why my guys 'ignore' my requests, noise is distorted by all of that fuzz!